Arrests In Gatwick Airport Drone Incidents Sussex Police say they have two people in custody in connection with harassment of the U.K.'s second-largest airport. It was shut down for hours for parts of three days in the holiday travel period. 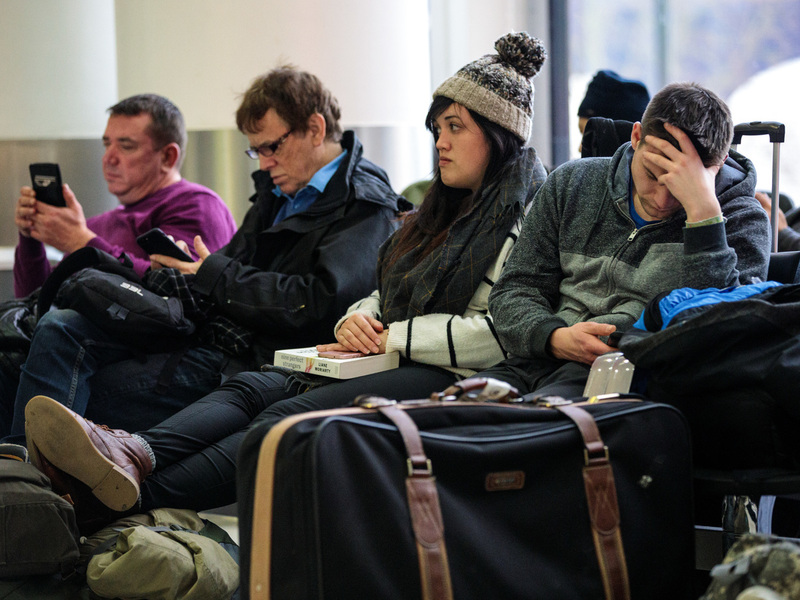 Passengers wait Friday at London's Gatwick Airport, where drone sightings repeatedly caused flights to be delayed and suspended at the height of holiday travel season. Police in Sussex, England, say they have made two arrests in the disruption of flights because of drone sightings at busy Gatwick, the U.K.'s second-largest airport. Flights had already resumed on Friday, after suspensions starting Wednesday night and a complete shutdown on Thursday night, leaving weary travelers longing for their holiday destinations. Police on Friday night said their investigations are ongoing and reiterated their call for members of the public to report anything they know about the drone operators. Airport officials had been confident enough that the skies and runways were safe to resume service after a drone sighting on Friday morning. "Flights have now resumed. Airfield movements were suspended while we investigated this as safety remains our main priority," airport officials said on Twitter, just an hour after announcing the Friday morning shutdown. That interruption was significantly shorter than one that began Wednesday night, when reports of unmanned aircraft nearby triggered a day and a half of suspended flights. But when the announcement came down midday Friday, just hours after those flights had resumed, travelers understandably braced for the worst. At least one frustrated tweeter seemed to speak eloquently for the more than 100,000 people who have had their plans disrupted at the U.K.'s second-busiest airport: "Oh, come on!" Drones were first spotted in the vicinity on Wednesday night, idling planes on the tarmac as officials sought to ensure the airspace was safe for takeoff. Under U.K. law, it is illegal to fly drones within 1 kilometer (0.62 mile) of an airport, and violators can face up to five years in prison. But this morning the airport announced that its only runway was available for arrivals and departures again. While officials there warned of "knock-on delays and cancellations to flight," at least the gears had begun to turn again, however briefly.